The following description is derived from the published 'Archaeological Inventory of County Meath' (Dublin: Stationery Office, 1987). In certain instances the entries have been revised and updated in the light of recent research. Date of upload/revision: 10 July 2007 Built between 1170 and 1205 on site of ringwork (ME036-048033-). Rectangular keep of four storeys with square towers projecting from middle of each wall, of which only three survive. Entrance at first floor of E tower with small chapel above. Triangular ward of same period defined on two sides by curtain wall with five D-shaped towers and two gateways, one with barbican. Third side of ward defended by River Boyne. Hall situated at N of ward. (PRIA 1978, 127-98). This monument is subject to a preservation order made under the National Monuments Acts 1930 to 2014 (PO no. 2/1965). 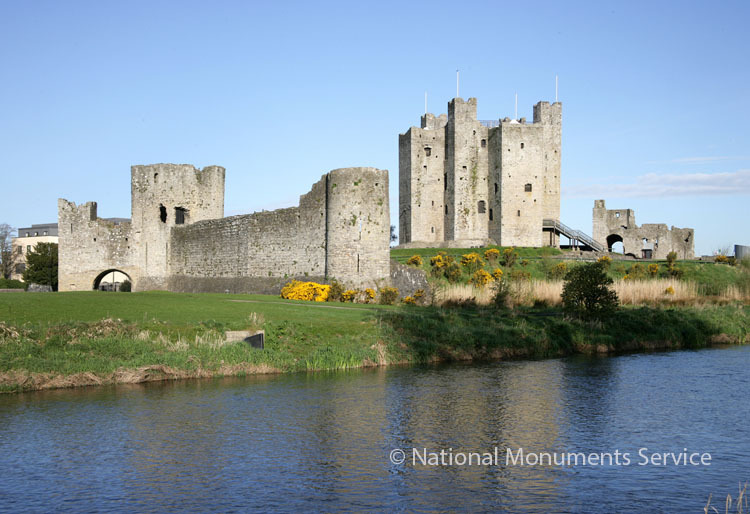 A masonry castle constructed in Ireland by the Anglo-Normans between the late 12th and the early 14th century AD.